More than 60,000 people protested in Toronto, Ontario on Jan. 21. 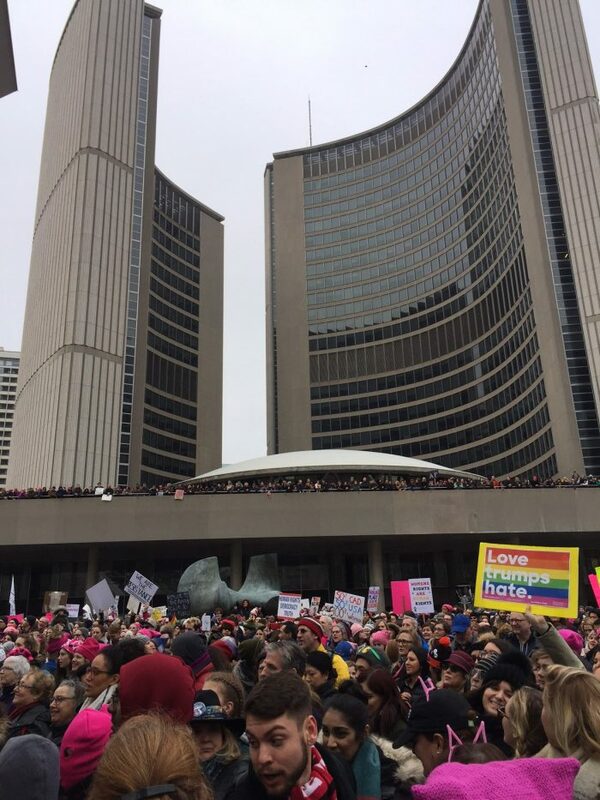 This photo was taken by TKN’s Joyce Grant, outside Toronto’s City Hall. Trump has made many insulting remarks about women. Some of his policies could make it harder for women to get healthcare, childcare, or equal pay for their work. Trump has also insulted people of different races and religions. He is also working on changes to U.S. laws that could keep many people who were born in certain countries (countries with mostly people of Muslim faith) out of the United States. About 673 marches took place in 55 countries. Around 3.5 million people joined in. The marches showed that many people around the world are concerned about gender equality, racial equality, religious freedom and protecting the environment. Twenty marches were held across Canada. The largest was in Vancouver, where about 15,000 people joined in. One of the smallest was in Sandy Cove, Nova Scotia, where 15 of the 65 people who live there turned out to march. Protesters say they do not want “Trump-style” politics to come to Canada. There were even two protest marches in Antarctica. Ninety-five scientists working at a U.S. research base, and a group of about 30 tourists visiting the continent held marches. Many scientists and environmentalists are worried because Trump says he doesn’t believe scientific evidence about climate change and other issues. They say many of his policies will be bad for the environment. Breaking news: On the weekend (January 28) Trump issued an “Executive Order” (a type of law that a president can pass on his own) that says people from any one of seven specific Muslim countries cannot enter the United States. As a result, many refugees and immigrants who had permission to come to the United States before the executive order were not allowed to enter the country when they arrived after the order was issued. This sparked enormous protests, including a large protest at New York’s JFK Airport. Within hours, a judge granted “a stay,” which means those people cannot be deported (sent out of the country again). The judge’s ruling does not mean they can stay in the United States, however. This news is “breaking,” meaning that it’s changing fast. Adults can access TKN’s Facebook page to leave a comment or discuss how they teach kids about news, media literacy and critical thinking. Many nations from all over the world have offered assistance to women and refugees in light of Donald Trump’s announcements this week. In your own life, when have you seen others offer to help when things got tough? Why do some people move towards solving problems when others retreat? Today’s article contains many different facts and details. What are the details and facts included in this story and how do they help to communicate the main idea of the article? Today’s article includes many numbers. Some are very big (3.5 million), while others are relatively small (15). How does including many numbers in an article impact its credibility? Why might numbers have this impact?